Views across to Cardingmill Valley. Highlands Bed & Breakfast is an ideal base for walkers, cyclists, gliders, golfers or nature lovers alike. All the accommodation at Highlands is comfortable, tastefully decorated and suited to your needs. There are two well furnished bedrooms that both have en-suite facilities. Breakfast is served between 7.30am and 9.30am every morning in the pleasant dining room which looks out over the back garden. The centre of Church Stretton and the railway station is a 15 minute walk away, where you will also find Carding Mill Valley; an excellent start for discovering the Long Mynd. 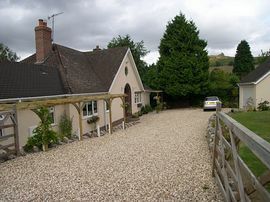 To the east of the town you can find even more beautiful countryside including the hills of Caer Caradoc, the Lawley, Ragleth and Hope Bowdler. For further information on places to visit in the area see our list of 'Things to do' via our website. 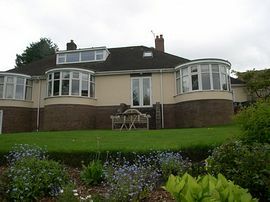 Family Lilac Suite from £25.00 pppn otherwise £27.00 pppn. Small supplements for single night and Single occupancy of a double room. Special arrangements may apply at Christmas and New Year. Special Diets Provision: Special diets are catered for. Those with allergies please advise at time of booking. At the A49 Church Stretton cross road/traffic lights turn onto the B4371 signed to Much Wenlock, 150 yds take the 2nd right into Hazler Rd. We are three quarter of mile up the hill on the left hand side.